Due out on August 14. 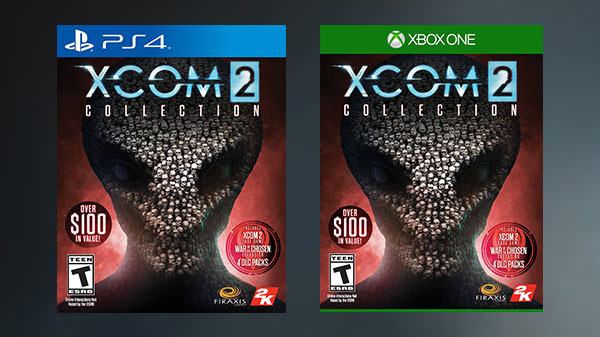 2K Games and Firaxis Games have announced the XCOM 2 Collection for PlayStation 4 and Xbox One. It will launch at retailers in the United States on August 14 for $59.99. XCOM 2: Alien Hunters – Transform the soldiers of XCOM into an elite alien hunting squad with impressive new weapons and armor to face off against new alien Rulers that will pursue your squad across an entire campaign. Additional cosmetic upgrades to soldiers and the Avenger are included, as well as a new epic mission where Central Officer Bradford leads a squad with the guidance of an old friend. XCOM 2: Shen’s Last Gift – Investigate ADVENT’s “Lost Towers” facility where Chief Engineer Lily Shen accompanies your squad in search of her late father’s secretive final project. Discover a unique new soldier class complete with powerful new combat abilities, strategy mechanics, and customization options. XCOM 2: War of the Chosen – The XCOM 2: War of the Chosen expansion adds extensive new content in the fight against ADVENT when additional resistance factions form in order to eliminate the alien threat on Earth. In response, a new enemy, known as the “Chosen,” emerges with one goal: recapture the Commander. The expansion includes new Hero classes to counter the “Chosen”, new enemies, missions, environments and increased depth in strategic gameplay.